This living room has some very appealing features, but a few bad decisions damage its overall design potential. The sofa, pillows and art work extremely well together. Color, proportion and layout create an inviting look. The simple plant on the left also adds just the right touch. The rug and coffee table almost seem to be part of another room. By having the rug and coffee table perpendicular to the sofa, the room feels awkward. The relatively simple appearance of the sofa and art are overpowered by the strong design on the rug and over-accessorized coffee table. From a functional aspect, the coffee table would be uncomfortable to use for drinks because it is too far from the sofa and has a long slot facing in that direction. Just a few changes would help this room look and work better. Against the concrete floor, a warm rug with more color would add personality. There are elements of blue and yellow in the artwork, and either or both of those colors would work well. The coffee table would be fine if it was turned so the long side paralleled the sofa and the pile of kaleidoscopes were contained or organized. The lamp pulls the room together and its silver finish keeps it from being intrusive. It adds an element of retro style to the room, an always interesting touch. This room feels adventurous and interesting, so by making these simple adjustments, it would also feel well-designed. Are you drawn to certain photos because of their colors? If so, you may be able to develop a design color palette for your home by looking through various photos. This beach scene provides a close up of small water-washed rocks and shells. Among them are a rich selection of browns and neutral tones. If these colors appeal to you, how about using this photo as the basis for decorating a room in your home? Take a look at the living room below. The caramels of the two shells in the front and back of the photo reflect the browns of the wood flooring and leather sofa. These shells stand out in part because of the soft neutral tones of the stones below. In the same way, the area rug brings cool and warm tones in a small pattern that allows those caramel browns to stand out in the room. There are darker shades among the stones and that touch of black adds personality. In the same way, the black touches in the room pull together to keep the colors from becoming one-dimensional. The stone that surrounds the fireplace along with the throw and pillows across the back of the sofa bring in some of the reds that appear in the shell toward the left of the beach photo. This works well with the caramel shades that make up a strong part of this room’s color palette. When you’re thinking about what colors you want to bring into your home, take the time to review photos of just about anything. You may be surprised at what you can come up with – a unique look for your home. This bedroom recreates an old fashioned and feminine look without a lot of expensive antiques and linens. If you want a room that feels like this one, just a few choices will enable you to have a room with a similar feel. Let’s start with the walls. The soft cream color creates the feeling of yesterday while still leaving your choices open on colors. The lavender color of the carpeting doesn’t require a matching color scheme. 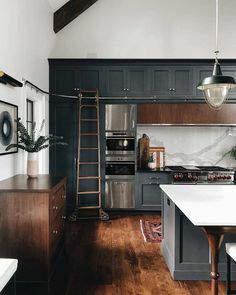 This type of grayish purple is actually considered a neutral, as long as the rest of the room stays generally in pastel tones. Keeping the bed linens toward the whites and off-whites helps to create the feeling of age even if the linens are new and selected from your favorite discount store. The two bolsters are actually white with sleeves of a pretty floral fabric. For about a half-yard of upholstery-weight fabric, you can dress up bolsters at a minimal cost. The canopy is a simple hand-done project. Buy two drapery rods in a color and style that suits the room. Attach them to the ceiling at the top and bottom of the bed. The sheer canopy is actually about 25 yards of inexpensive fabric draped and wrapped around the two rods. With a little planning and experimentation, you can create the feeling of a four-poster bed without having to buy one. Little touches like antique accessories or small area rugs and additional pillows can be added as desired. But even as simple as this room is, it still has an inviting old fashioned feel. Architectural elements don’t have to look traditional. This condo home is interesting architecturally while still staying completely contemporary. The immediate area of interest comes from the openings in the wall separating the dining area from the front entryway. The squares are evenly distributed across the wall, providing small glimpses into the room on the other side. To add interest, some openings are painted in a contrasting color and others are filled with Plexiglas boxes holding fruit. The clear boxes leave this wall open to possibilities for a homeowner. The other interesting architectural decision is the tile montage on the wall over the dining table. Once again, a modern perspective runs through this piece and the simple style and two-color approach provides a lot of flexibility in design. Having tile right next to the dining table almost creates a backsplash effect – with no worry about staining the art. Other architectural elements that add personality include the luscious marble floor and the appealing door design toward the back. The black frame and glass styling once again help the space feel open while providing natural separations between functional areas. This condo is simple and modern while still being light and inviting. Smart architectural design combines with interesting personal additions to create a beautiful space. You may have had a chance to make little pinch pots or larger bowls in clay, using coils of clay to build up the sides of your artistic creation. Skilled potters also throw bowls, vases and other containers on a potter’s wheel. Not as easy as it looks, it’s common for a piece to collapse just as you think it’s perfect. In ancient days, clay was the primary material for all sorts of containers. From dried seeds for the next year’s planting to unguents and oils that were the moisturizers of the time, clay containers, generally with wax seals, were in steady use. Eventually clay, when combined with straw for strength, made bricks and unglazed clay tile not unlike the ones above replaced dirt for floors. Today most of our clay tiles and containers are glazed and professionally fired. However, it’s still possible to find clay flooring that echoes that older approach. In rural Mexico, unglazed tiles are made from local clay and dried in the sun. Colors change from tile to tile and the surface is uneven. You may even see a paw print or two from local small animals who happen to run across a few tiles on their way from one side of the outdoor tile studio to another. The image to the right shows how beautiful these tiles and pots can be in an outdoor setting. The look is rustic but it has its own type of elegance. Terra cotta becomes its own neutral against the red, green and dark browns of the other elements. Thanks to modern production methods, ceramic tile today comes in a rich selection of sizes, shapes and colors. But don’t dismiss the magic of the original clay products – simple tiles and pots such as those displayed in this space. Are babies a part of your life? If you have children, they’re probably front and center. But even if we’re talking about grandchildren, nieces and nephews, or the children and grandchildren of friends or neighbors, most of us are lucky enough to have children in their lives. You may keep cookies in the kitchen for little visitors, or possibly a few toys around for entertaining any children who happen into your home. Grandparents, of course, want to make their homes a special haven for the little ones in their lives – available to spoil without any need for the discipline they provided their own children. When you’re making choices about how to keep your home inviting for the smallest members of your life, think about your flooring. Children play, crawl and learn to walk on the floor. Their shoes just don’t stay on for long and they run around in bare feet or footie PJ’s. Do you have carpeting or rugs that provide a comfy special place for the children in your life? When you’re choosing flooring, think about how it feels as much as how it looks. Run your hands across the surface and press down. Does that rug or carpeting invite bare feet? Would you like to lie down and snuggle with your best baby doll on that floor? Or maybe just read a story to your baby brother. Sweet soft babies deserve soft carpeting or rugs for their play and learning. Make your best effort to give them that along with all of the support and consideration you can. Now the kids are back at school, you’ve got time to do some Fall Homework of your own. And the Century Tile Fall Homework sale is on now. Look out for Fall Homework Deals in all 12 Century Tile stores. We have 25% off our entire Arbor Collection of Distinctive Hardwoods, including both ¾ inch solid hardwoods and engineered hardwoods. You can choose from 45 different woods in a huge range of colors, all finished for durability. The collection includes distinctive hand scraped, high gloss and satin finishes. Save up to 50% on top quality Ceramic and Porcelain tiles, with prices as low as .77 cents per square foot. We’ve got hundreds of sizes and colors, floor and wall combinations, large format floor tiles, and even decorative Mosaics. But remember, stocks are limited. So get in early and score a Century Tile Fall bargain. Century Tile has a huge range of stylish flooring, over 60 years experience in Chicago, highly trained staff to help you make the right choice and a professional installation team ready to fit your new flooring. Century Tile. Flooring solutions hotter than the new Math teacher. The long narrow shape of this urban townhome needs careful planning to turn it into the luxurious and inviting living space shown here. 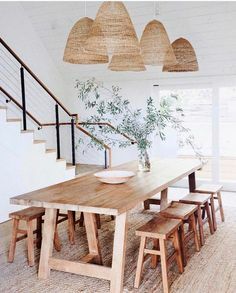 Certain design choices lead to a space that is clearly delineated by function yet connected by style. The central section – across from the kitchen to the center left – has a lowered ceiling and a band of wooden panels to create a natural separation that doesn’t block the sight lines. The floors are concrete throughout, but area rugs warm up the space and add dividing lines. The cream-toned rug under the dining table is a good match with the chair cushions, linking this space through the color. The long light fixture and centerpiece emphasize the shape of the space. A number of other choices also reflect this elongated lower floor. The floating shelf along the paneled wall provides a moment of interest with the graceful vertical sculpture. The white shelf and metallic sculpture stand out against the dark wood. This adds a special touch of design and art to the wide hallway. The living room at the front of this home uses the sofa to create a natural division of space. Art and another area rug help make the space feel complete and defined. Once again cream plays a major role. This townhouse shows that you can use floor, wall and ceiling changes to create natural breaks between rooms while still allowing the space and views that keep a home feeling large and expansive. View our large selection of area rugs and let us help you find the perfect one for your home! This room shows that loft living can move beyond the traditional industrial modern look into something classically elegant. The soaring brick wall and window in similar large proportions let you know that this is loft space. These dramatic architectural details elevate the space beyond the standard. The stained concrete flooring is a fairly common choice in a loft, but the ceiling is unusual. Instead of a collection of vents and pipes disappearing into a dark high space, this designer chose to cover that with wood flooring. Choosing wood warms up the entire room and brings the ceiling height down while covering the more industrial elements of the space. Dark wood tones echo in the coffee and corner tables, furthering the connection. Accessories and art add glamour, with an old-fashioned mirror displayed vertically and a large oil painting standing alone on the cream-colored plaster wall. The generously-stuffed sofa and chair do a lot to make the room feel comfortable and inviting. Colors are natural and arise out of the architecture. The throw pillows echo the rich dark shades from the wall and ceiling as well as the painting. 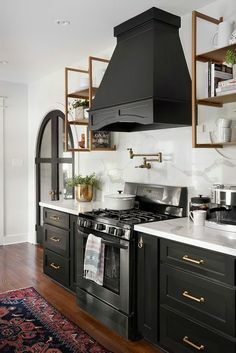 The one pop of black – on the border of the area rug – brings the room into focus and emphasizes the soft colors in the rest of the space. Altogether, this loft design melds the advantages of loft living with all the comforts of home.